It's Amazing What A Simple Piece Of Inexpensive Gear Can Do For you! Something that any long-suffering photographer will notice about their development within the craft is that overall growth is generally steady and subtle, but it is occasionally marked by moments of seismic revelation. Let us assume, for instance, that you’re a budding portrait photographer who almost exclusively shoots outdoors (perhaps due to a preference for natural light or a lack of funds/space to invest in studio lighting). Here's a scenario – You’ve got the right clientele (people willing to be your guinea pig for an hour or two). You’ve got all the technical stuff figured out and you’re making great creative strides. To be sure, reflectors have their place in studio photography, but they are particularly useful for natural light photographers due to the fact that the quality, quantity and behavior of natural light are entirely out of a photographer’s control. Taken on its own merits, there’s really nothing special about a reflector; it does exactly what the name suggests — it reflects light. Here are four ways a reflector can instantly transform your portraits. This is probably the most common use for a reflector. While studio photographers can dictate the position of their strobes/flashes, natural light photographers don’t have such a luxury. Shooting when the sun is high in the sky, for example, can create deep shadows under the eyes, nose and chin — a look that neither you nor your subject will approve of. You can avoid this by simply placing a reflector at about waist level to your subject; the light that reflects upward onto your subject’s face will fill in those shadows beautifully. One of the best things about using a reflector in this manner is that your model can easily hold it, thus eliminating the need for an assistant or a stand. 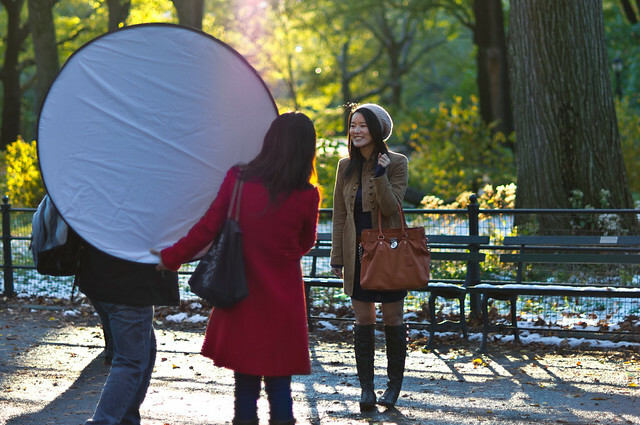 Believe it or not, a reflector can also serve as the main light for a portrait. The setup is simple, even if it goes against the grain of what you’ve learned about portrait lighting. In this scenario, you will position your subject with the sun behind them; if you were to stop here, you’d be photographing a silhouette. But with a reflector positioned at a slight angle in front of your model (this time you will need a stand or assistant), you can bounce some of that softened light onto their face, with the sun serving as a rim light. It sounds totally counterintuitive, but you can also use a reflector to block light. When would you want to do this? One example would be when you’re working under the shade of a tree. Trees provide excellent cover when the sunlight is especially intense; tree shade isn’t always a perfect solution, however, as sun rays can filter in through the leaves and dot your model’s face with beams of light. Here, a reflector can do the opposite of what you would normally use it to block light to prevent hotspots from ruining a portrait (this is another scenario where you will need someone or something to hold the reflector). You may be asking yourself what kind of reflector creates shadows, to which the answer would be a “black reflector,” which will just raise more questions for those who are new to using reflectors. Oxymoronic terminology aside, a black reflector is used to absorb light and helps create shadows — not harsh, ugly shadows like those that tend to result from hard lighting, but softer, gentler shadows that can add a touch of drama to a portrait. 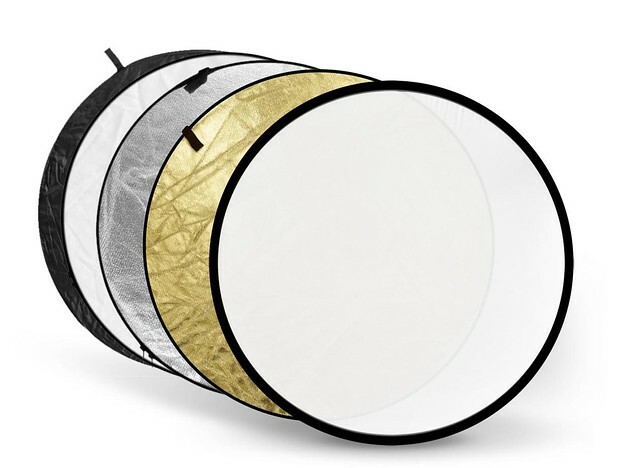 As alluded to above, reflectors come in different “colors” — white, silver, gold, black and translucent — conveniently packaged as 5-in-1 kits in order to maximize portability and versatility. With the exception of the black and translucent reflectors, each type serves the same essential purpose; the gold and silver reflectors will impact the color cast of your shots, so it is important to be sure they match well with your subject’s skin tone. The translucent reflector acts as more of a diffuser and is useful for softening harsh light. If you don’t own a reflector or find yourself in a situation where you really regret not bringing your reflector kit along, it’s good to know that a makeshift reflector is usually within arm’s reach — a white t-shirt, newspaper, poster board, a wall/side of a building. In short, anything that reflects light sufficiently can aid you in lighting your portraits. Beautiful portraits don’t require any special equipment. All it takes is an understanding of the basic characteristics of light and a bit of creativity to modify the light so that you get the effect you desire. If someone were to ask me what is the single most useful tool (besides a camera, of course) a natural light portrait photographer should own, I’d say without hesitation, a reflector. Whether you pick one up from your favorite camera store or craft one out of household materials, proficient use of a reflector is something that can instantly transform your portraits from blah to brilliant. Firstly, to improve your portraits and get that little extra from your photos (that you may not have been aware of) get yourself a 5-in-1 Reflector. 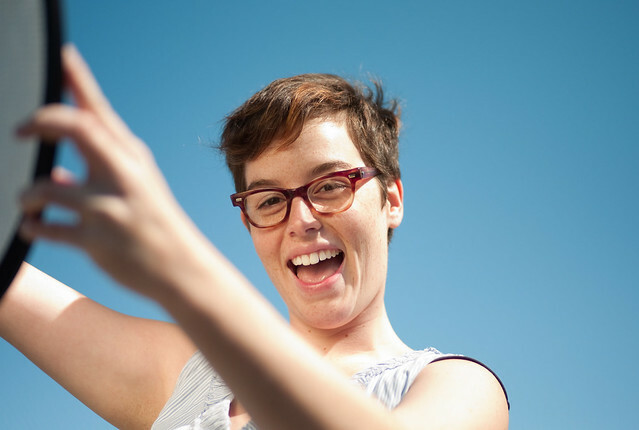 They'll really shape your photography's potential and take things to a new level for you! Yes, definitely consider using a reflector as Fill Light but why not try it as a Main Light source for your subject? Don't forget you can also use a reflector to block unwanted light – i.e. streams of sunlight on a harshly-lit summer's day or as a way to soften shadows. The Art of Portrait Photography – this is THE course guide for you if you’re really serious about upping your game in portraiture. With this you'll learn the tricks, tips, hacks and just good old fashioned hard-earned skills to push your capabilities way beyond what you thought possible! The guys at Photzy understand just what it takes to produce outstanding portraits!